A roadmapping workshop facilitated by IfM Education and Consultancy Services (IfM ECS) brought academics and industrialists together to develop an industrially-relevant strategy for bulk superconductivity research. The Bulk Superconductivity Group, part of the University of Cambridge Department of Engineering, researches superconducting bulk materials which have the potential to replace conventional permanent magnets in things like motors and generators, with an improved performance. Representatives from the Group and from companies including Siemens, Boeing and CAN Superconductors worked together to scope potential future developments of the field and align research activities with the needs of industry. Dr John Durrell, University Lecturer and Group member, coordinated the project. The final report can be found here. IfM ECS specialises in helping universities understand which of their research streams have both academic and industrial relevance. 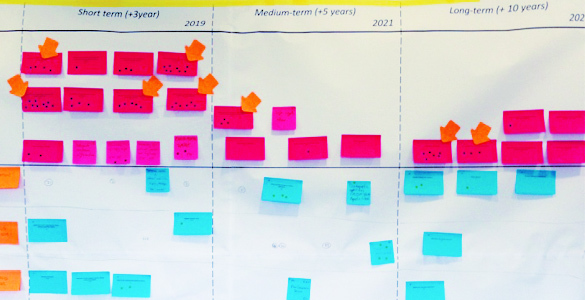 Using business tools and processes developed at IfM, such as roadmapping techniques, IfM ECS has designed three types of workshops which help universities and industry develop fruitful collaborations and support the successful commercialisation of research. identifying commercial applications for a particular technology.